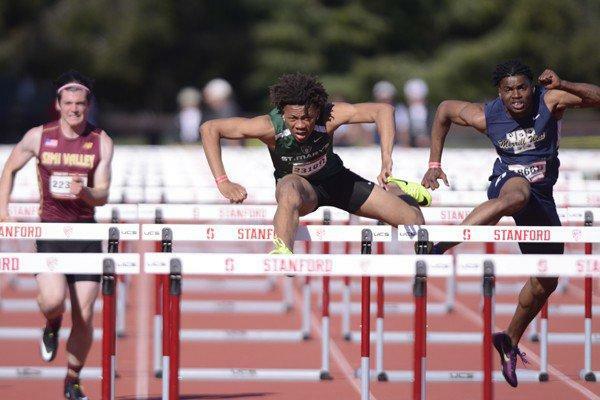 The most prestigious high school track and field meet in Northern California, took place this past weekend and it did not disappoint. With several out of state athletes as well as some of the top teams/individuals from the Southern Section, the result was a slew of outstanding marks led by some of the leading Northern California athletes. 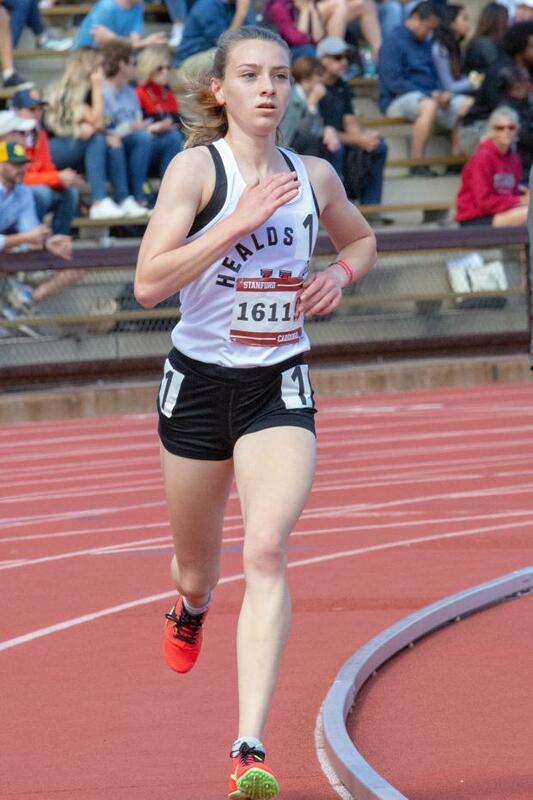 On the track, the girls' 3200m led off the festivities with Gabrielle Peterson of Healdsburg (Malcolm Slaney photo) once again dominating another outdoor 3200m. Just as she did at the Dublin Distance Fiesta, Peterson led from the gun and had some company during the early laps but it was a solo effort the rest of the way as she posted a lifetime best of 10:27.33 as she just missed the meet record set last year by Malibu's Claudia Lane (10:24.72). For the boys, Liam Anderson of Redwood was equally as dominant in the boys' race as he darted out to the lead and led through the first lap in 65 seconds. He lowered his own meet record of 9:08.93 from last year to 8:59.77. Adam Sage of Los Altos was the next finisher at 9:27.21. The next track event for the high schoolers was the 400m hurdles. Taylor Weidinger of Las Lomas won the fastest heat out of lane one with a best of 62.39. That is CA #3 in the rarely run event. For the boys, Joey Monti of Los Gatos led for most of the race but was surpassed by Dylan Murray of Willamette (Oregon) with a personal best of 54.35. Murray held off a hard-charging Jamar Marshall of St. Mary's Stockton who was disqualified for a hurdle violation earlier in the race. The first girls' relay of the meet took place next with the always popular Distance Medley Relay. The result of the race was a replay of the earlier Dublin Distance Fiesta as St. Francis, Sacramento junior Isabella Fauria received the baton in 3rd place and rallied the Troubadours to the victory. They lowered their CA #3 time to 12:21.47. Amador Valley and Palos Verdes finished in 2nd and 3rd respectively. In the boys' DMR, Palos Verdes led through the first three legs and eventually finished in 3rd place. The Jesuit boys were in contention during the first three legs and gave the baton to their star junior Matt Strangio in 3rd place. Strangio quickly gobbled up the leaders with a fast first lap and eventually split 4:12 for his 1600 split. The St. Francis, Mountain View boys finished in 2nd place behind Jesuit with a season-best 10:23.00. 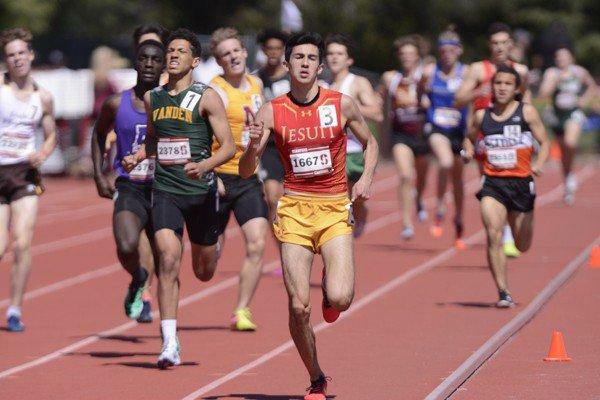 Jesuit's winning time of 10:13.58 is CA #1 as that time will get plenty of challengers next week at Arcadia. In Friday's field events, the top three boys all cleared the same height of 15-6.25 in the pole vault. Vicentejordan Vanderlipe of Everett Alvarez HS in CCS was clean through the winning height and then had three failed attempts when the bar was moved to 16 feet. The California leader at 16-8, Lodi's Samuel Wright, finished in 2nd place as he cleared 15-6.25 on his 2nd attempt. Scott Toney of St. Francis, Mt. View also cleared 15-6.25 but had a miss at an earlier height to place him third. In the long jump competitors, Silver Creek senior Jazlynn Shearer soared past the 19-foot mark at 19-0.25. That puts her at CA #6 and her victory this year followed a 4th place finish at last year's meet. Jasmine Jones of Greater Atlanta Christian in Georgia finished in 2nd place with a best of 18-8.5. In the boys' competition, St. Mary's Berkeley junior Malcolm Clemons was the defending meet and 2018 California state champion. He missed the competition due to injury which left the door open for multiple jumpers. In the end, The King's Academy senior Bralyn Lux improved his lifetime best to 23-3.25 for the victory. That puts him at CA #8 and continues to be the top jumper in CCS. John Kroeger of River Valley finished in 2nd place with a jump of 23-1.25. Following the trials of the 400m relays on Saturday, the girls' 1600m got the HS finals underway. Healdsburg's Gabrielle Peterson scored her second victory in two days with another front-running effort in the four-lap event. Her winning time of 4:52.08 places her at CA #5. Six girls dipped under the 5-minute mark with McClatchy's Julia Heckey in second at 4:55.24 just ahead of Concord senior Rayna Stanziano at 4:55.94. For the boys, Jesuit's Matt Strangio did most of the work up front as he was shadowed by Liam Anderson of Redwood throughout most of the race. Anderson moved up alongside Strangio on the final lap and eventually powered away from him over the last 200 meters. His effort was featured on the MileSplit national site this morning and you can view the race and kick below. Anderson's time of 4:13.49 places him at CA #3 just ahead of Strangio's 4:14.40. In the girls' 4 x 100m relay, the St. Mary's Berkeley girls proved to be the class of the field as they easily won the finals with a time of 48.50. They also posted the fastest time in the trials at 48.69. The Menlo Atherton girls posted the fourth fastest time in the trials but moved up to second in the finals with a season-best 49.37. For the boys, Monterey Trail led the trials at 41.95. In the finals, they improved their season-best time to 41.68 which places them at CA #3. The Pitman boys finished in second place with a best of 42.53 (CA #17). The fastest returning 800m runner in the state did compete here although she was doubling back from the 1600m earlier in the day. Rayna Stanziano of Concord led the field through the first lap but the tough double got the best of her in the second lap. With five girls all contention for the win at the top of the turn, it was St. Francis, Mt. View sophomore Isabelle Cairns who powered away from the field with a winning time of 2:12.90. Two Mission Viejo runners finished in second and third with Morgan Calcagnie at 2:13.14 and Ashley Johnson at 2:13.85. In the boys' 800m, Vanden's Quinton Alexander led the field through the 600m mark with Jesuit's Chase Gordon in hot pursuit. Gorden took the lead with about 150m to go in the race and finished with a personal best time of 1:53.25. That puts him at CA #3. Armijo's Nixon McKenzie closed well to finish 2nd in 1:54.33. St. Francis, Mt. View junior Euan Cairns sprinted past quite a few runners down the stretch to catch Alexander at the line 1:54.59 to 1:54.65. In the girls' 400m, two girls ran faster than 56 seconds with Egbe Ndip-Agbor of Corona taking the win at 55.44. Eastside Catholic's (Washington) Kate Jendrezak finished in second place at 55.74. For the boys, Zachary Larrier of Monterey Trail proved to be the class here as he easily outdistanced the field with a winning time of 48.34. Teammate Camden Wheeler finished in second place with a time of 49.20. In the girls' 100m Hurdles final, Jazlynn Shearer of Silver Creek got off to a fast start and held the lead through eight hurdles. Jasmine Jones of Great Atlanta Christian surged past her over the last two hurdles to just edge Shearer 13.49 to 13.52. For the boys, Jamar Marshall of St. Mary's Stockton led through the race and finished with a near season-best 13.99 into a headwind. Warren Williams of Merrill West kept Marshall within striking distance and finished with a time of 14.18. At the 2018 Stanford Invitational 100m sprint final, Chinyere Okoro lost by .001. There was no such drama this year as Okoro won with a time of 11.69. She was the only sprinter in the field under 12 seconds. For the boys, John F. Kennedy's Alonzo Floriolli edged out Monterey Trail's Larrier 10.72 to 10.78. In the final competition of the day, the Sheldon girls proved to once again be the best team in the 1600m relay. Anchor Tatumn LaChapelle received the baton in second place and powered her team to victory as she passed the St. Mary's Berkeley anchor Sofia Bailey on the backstretch and hung on for the win with a time of 3:55.95. The Los Gatos boys won the final event of the day with a time of 3:22.32. They had a sizable lead going into the final leg which they needed as the second place finishing Monterey Trail had Larrier at anchor. Monterey Trail's final time was 3:23.56. In the field events, John Maka of Pittsburg was the winner in the boys' discus. He moved into the lead on his first attempt and had his best throw of 176-8 on his final throw. In the shot put, Los Gatos thrower Max Gurevitz posted the winning mark of 53-1 on his first attempt and won comfortably over the rest of the field. Senior Laurel Wong of Santa Catalina easily won the pole vault with a 12-5.50 winning effort at the facility she will be training at each day for the next four years. The girls' triple jump competitors had a tough act to follow after four competitors sailed past 40 feet at the 2018 Stanford Invite. This year, the class of the field was Vanden's Sameerah Evans as she won with a mark of 38-0.25. Kijana Hilton of Bellarmine won the boys competition with a best of 45-7. In the girls' high jump, Lincoln of Stockton's Aylana Crosby was clean through 5-6 and that ended up being the winning effort for the competition. In the boys' high jump, San Marcos senior Beau Allen had a best of 6-8 to just edge out Roseville's Donovan Jones who also cleared the same height. 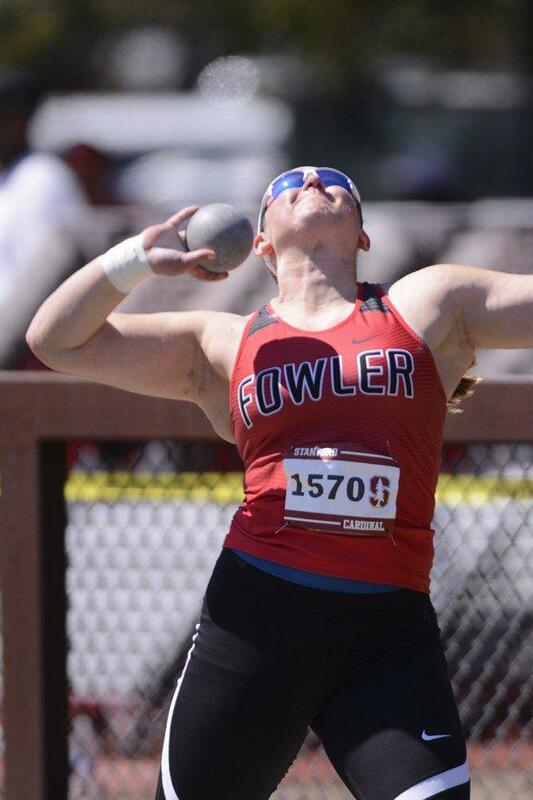 In the girls' throwing events, Fowler's Jocelynn Budwig was the dominant thrower of the competition. She won the discus with a mark of 164-6. That is her second-best winning effort of the season trailing only her 171-7 at the Gateway to Track and Field Invitational earlier this season. In the shot put, Budwig, the defending state champion, had a very solid 46-4.75 for another easy win. She has a season-best of 47-4.25, also from the Gateway meet, which ranks CA #2.